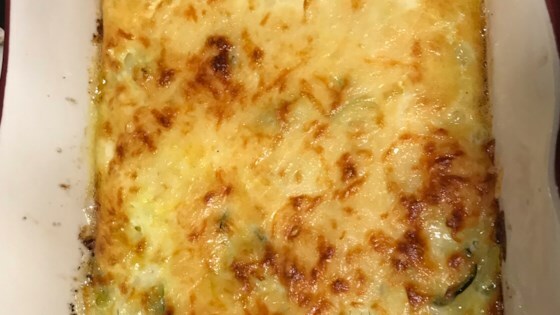 "A simple to prepare, creamy onion dish. Originally submitted to ThanksgivingRecipe.com." An easy balsamic glaze provides a flavor twist to this classic green beans dish. I thought this was a wonderful dish. It needs to be served hot - right out of the oven in order to fully appreciate the creamy sauce. I made this 3 years ago for a family gathering and I have been asked to bring it again every year. Good, but very greasy. I prefer "Moms Yummy Onion Casserole" on this site. This was very good. I think next time I will sauté a little garlic with the onions. This was so good! My husband and I love onions, and this really hit the spot! I think next time I will add some thick hickory smoked bacon pieces. Mmmmmm! This was totally easy to put together. My husband and I are cheese and onion lovers. This is our new (replate the boring green beans) favorite recipe for the holidays. This was good, but makes way more than 7 servings. You only need a small spoonful. I might make it again. Absolute perfection!!! I had a few requests for this recipe, and printed them off at my Christmas dinner! I wouldnt change a thing... a definate new staple for christmas... et al!